The Yaesu YO-100 is a station monitor scope that will allow you to monitor and adjust your transmitter for the cleanest signal possible. The YO-100 is compatible with virtually all transmitters and transceivers. The cabinet and front panel design of the YO-100 matches that of the FT-101B/277B and FT-201 series of Yaesu equipment. The features include a wide range of inputs for monitoring many different modes, such as SSB, CW and Digital. A built-in 1500 Hz and 1900 Hz tone generators greatly adds to the versatility of this station accessory. 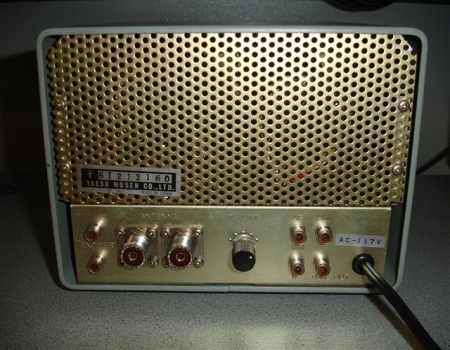 This two-tone generator produces the proper audio signals to perform a "trapezoidal" pattern for testing the linearity of a transmitter or amplifier. The specifications are as follows, for the vertical trace the sensitivity is 200 mV P-P/cm and the frequency response is 10Hz to 60MHz. For the horizontal trace the sensitivity is 300 mV/cm, the frequency response is 10Hz to 16kHz and the sweep frequency is 10 Hz to 10 kHz. The two-tone generator frequency is 1500 Hz and 1900 Hz which is Independently selectable by front panel controls and has an output level of 50 mV. The YO-100 uses 5 tubes in it's circuit which are as follows, a 12BY7A as an Audio Frequency Amplifier, a 12BY7A as an I.F. Amplifier, a 12AT7 as a Clamp, a 3RP1A as the Cathode Ray Tube and a 6AL5 as a R.F. Detector. The YO-101 is the solid state version of the YO-100. The size of this item is 8 1/4" wide by 5 7/8" high by 11 1/2" deep and weighs in at 13 1/4 pounds. 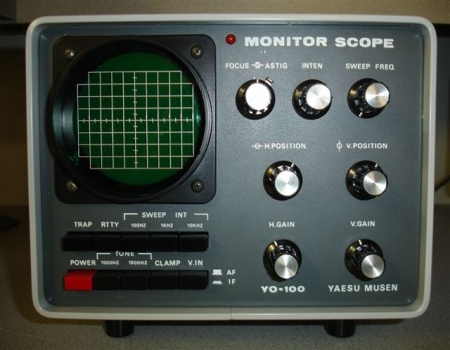 A monitor scope is a simplified version of an oscilloscope. In these next two photographs, the cover or case has been removed. 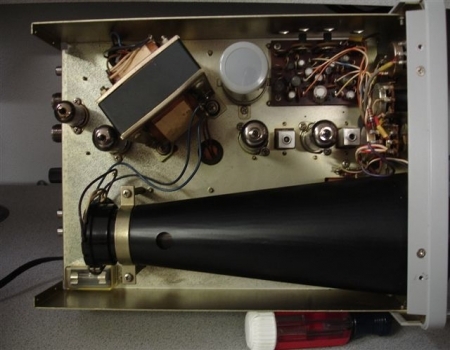 The picture on the left is of the top of the unit, here we can see the large 3RP1A CRT(Cathode Ray Tube), transformer and the two-tone generator circuit board. The picture on the right shows the bottom of the YO-100. The circuit board on the top is the rectifier unit responsible for the 1200 volt DC supply and the 30 volt DC supply. 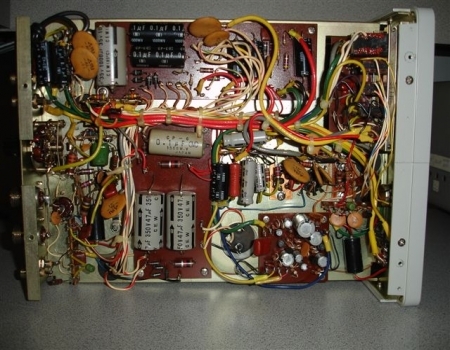 The brown circuit board in the center with the 3 large gray capacitors on it is the rectifier board that provides both 600 and 300 volts DC. The circuit board on the lower right is the sweep generator that produces a saw tooth signal for the CRT deflection plate.